I think there are two types of cookie-lovers in the world: those who like raisins, and those who don’t. My sister does NOT like raisins, so I spent most of my childhood learning to bake things without raisins (my grandfather’s famous Oatmeal Molasses Cookie recipe excepted!) to accommodate her. Once something becomes a habit, it’s hard to break. But back to raisins! I bought a box of the golden variety a while ago for barmbrack, and I’ve been wondering what to do with the rest. 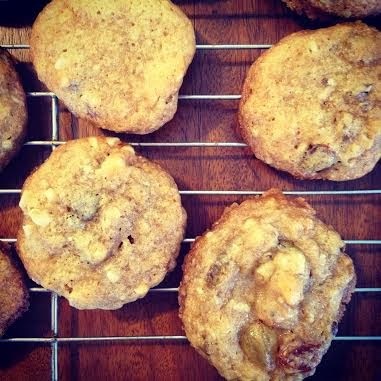 When I found this recipe, I knew it had a good chance of success… and indeed, the cookies are delicious, buttery wonders. Preheat oven to 350 degrees F. Spray two baking sheets with baking spray. Soak raisins in enough hot water to cover until soft, about 15 minutes. Drain; set aside. Roast the walnuts in a cake pan for 5-8 minutes in the oven, then cool in separate dish (if desired). Mix flour, baking soda and salt in large bowl. Beat butter and both sugars in another large bowl until light and fluffy (to do this without a stand mixer, make sure butter is room temperature – malleable – and beat with hand mixer. Add eggs one at a time, beating well after each addition. Mix in vanilla. 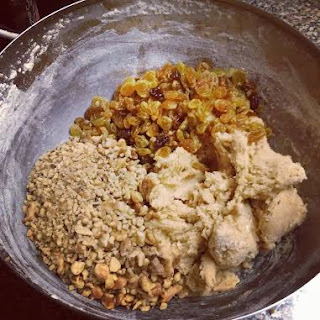 Add dry ingredients; mix just until blended. Fold in nuts and raisins. Using palms of hands, roll dough into 3/4-inch balls. Arrange on baking sheets, spacing evenly. Bake until cookies are golden brown, about 12 minutes. Transfer cookies to racks; cool completely. Note: The recipe says to roll the dough into balls, but I found that this only worked after I'd chilled the dough in the fridge overnight. When I first made it, the cookie batter was a little too sticky, and the cookies were more of the 'drop from spoon onto pan' variety. They turn out the same regardless. Expect thin cookies with crispy edges. Oh! And I found I got a more uniform result when I switched racks halfway through. Recommended for: fans of raisins and nuts, and anyone who likes a buttery cookie to go with their morning (or afternoon, or evening!) coffee. I'm in the pro-raisin camp and I particularly like golden raisin. I'm participating in a cookie exchange in a couple of weeks -- I'm bookmarking this post as good possibility for me. Count me firmly in the raisin camp and these cookies look delicious. Those are the kind of cookies that make me so glad I don't have to be on a gluten-free diet forever, but am only keeping a gluten-free kitchen through the holidays. These will have their day sometime during the winter for me! 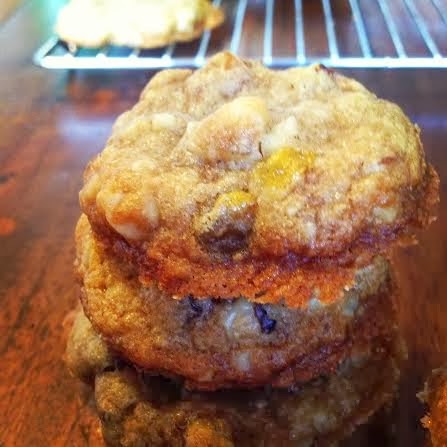 Oatmeal raisin is one of my favorite cookies. I'm in the no raisin camp ( and feeling a bit lonely there today BTW), but your cookies do look delicious, I'd certainly try one. Oh yum! I totally in the raisin camp. I just bought a box of golden raisins yesterday--they're destined to go in my apple cake for Thanksgiving. Everything is better with raisins. These look delish! 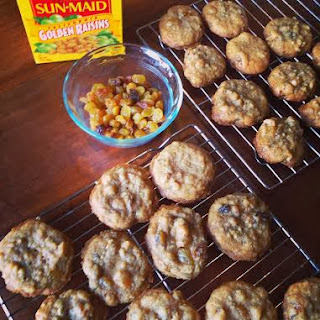 I've never been a big raisin fan (I think, mostly, because I always wish they were chocolate chips), but I've come to love golden raisins, especially in cookies -- these look wonderful. I love a good buttery cookie, and yes I definitely like raisins and nuts in mine. I always feel a bit cheated if there aren't any raisins.